Body odor, or smelly sweat, is an unpleasant scent that is the result of excessive sweating. There are many health conditions that can cause excessive sweating, such as thyroid disorders, but for women about the end their reproductive years, menopause is generally the culprit. Continue reading to learn more about why does sweat smell as well as how it's related to the menopausal transition, including what you can do to counteract the stinky symptom. There are two main types of sweat glands: eccrine glands and apocrine glands. The sweat glands that are found in your armpits and groins - apocrine glands - secrete a milky, odorless fluid when under stress or aroused. When bacteria on the skin break down this sweat, body odor is the result. Factors that worsen body odor include consuming spicy foods, being overweight, and taking certain types of medications, like antidepressants. What Causes Sweat to Smell during Menopause? Due to drastic hormonal fluctuations throughout the menopausal transition, middle-aged women are more prone to suffering from vasomotor symptoms. As such, increased sweating from hot flashes and night sweats can cause a bad sweat smell. Moreover, any stress or anxiety provoked during this time will trigger the thicker secretions of sweat from the apocrine glands. 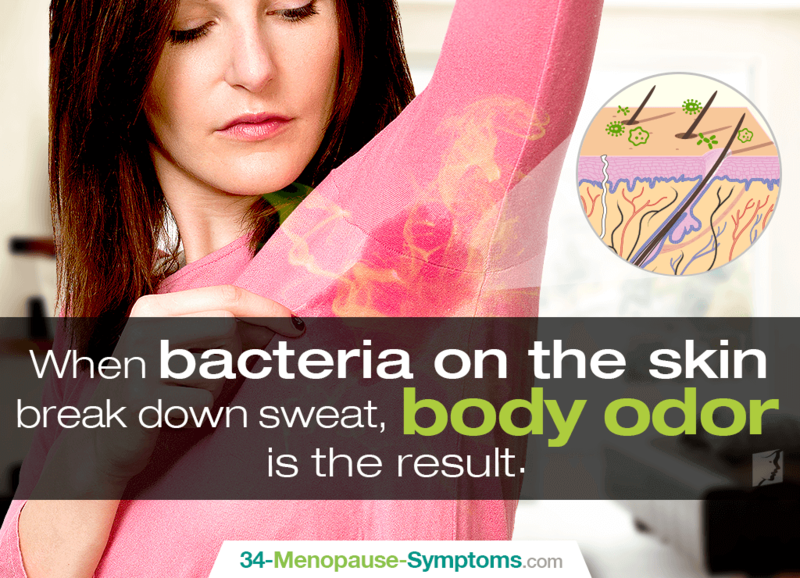 As the bacteria mix in with the sweat, body odor is the consequence. What Can I Do to Manage Sweat Odor? Managing smelly sweat begins with getting rid of excess skin bacteria causing the odor in the first place by keeping the skin in the areas clean and dry. Many of the following techniques also allow sweat to evaporate quicker, preventing bacteria from having enough time to break down sweat and produce body odor. Heed general hygiene tips of bathing or showering regularly; washing your armpits sufficiently with antibacterial soap; shaving regularly; wearing clean, breathable clothes; and applying deodorant or antiperspirants after washing up. Remember deodorants mask the smell of sweat while antiperspirants lessen the quantity of sweat produced by the body. What Can I Do to Treat Sweat Odor? Treating sweat smells starts with recognizing the underlying cause. For menopausal women, this is hormonal imbalance. Treatments for changes in body odor focus on changing your diet to include plenty of phytoestrogenic foods - soy products, flax, sesame, oats, barley, etc. - to compensate for the declining hormone levels in addition to avoiding caffeinated, spicy, or strong-smelling foods, which may cause you to sweat more, thus leading to stronger body odor. Also, practicing mind-body techniques of yoga and meditation to control any stress that could prevent triggering sweaty episodes. Taking advantage of alternative medicines, such as phytoestrogenic supplements - black cohosh, dong quai, etc. - and hormone-regulating supplements, like Macafem, can bring enhanced results. The latter can be considered one of the safest ways to promote body equilibrium and get rid of sweat smells once and for all as it encourages the endocrine glands to produce their own hormones. In general, body odor is caused by the breakdown of sweat by bacteria, causing bad sweat smells. For menopausal women, excessive sweating from hot flashes and night sweats in addition to stress or anxiety cause disagreeable sweat odors. Luckily, management can be achieved with proper hygiene to get rid of excess bacteria and allow sweat to evaporate more quickly. Take measures of washing entire body regularly, shaving often, wearing breathable clothes, and applying deodorants or antiperspirants frequently. Treat smelly sweat caused by menopause by balancing hormones holistically with an optimized diet, new mind-body routines, and alternative medicines. Follow these easy steps and you will be feeling fresh again in no time! Carlson, K.J. et al. (2004). The New Harvard Guide to Women's Health. USA: Harvard University Press. Available from Google Books.